March 31st, 2011 03:20 AM | by William Bell | Christian Prophecy. The Local Church Post 70AD? What is the status of the local church post 70 AD? Some see no relevance for the local church after Christ’s returned in the first century. They believe that the church only continued up to that point, claiming it was a Jewish institution. We dealt with that fallacy in the previous article on Israel’s Hope – The Body of Christ. We strongly encourage you to look at some of the points we made. Since we discussed the “body of Christ” in particular, our focus was on the church as the divine institution sent down from heaven by God, (2 Cor. 5:1; Rev. 21:1-3). It is the tabernacle of God “with men.” It corresponds with the “spiritual body” of 1 Corinthians 15:44, which as a constituent element in the resurrection motif, corresponds to the kingdom of God. This same correlation can be seen in Hebrews 12:22-23 and v. 28 which speaks of the soon coming of the church (the ekklesia) of the firstborn or firstfruits and the unshakeable, unmoveable kingdom. 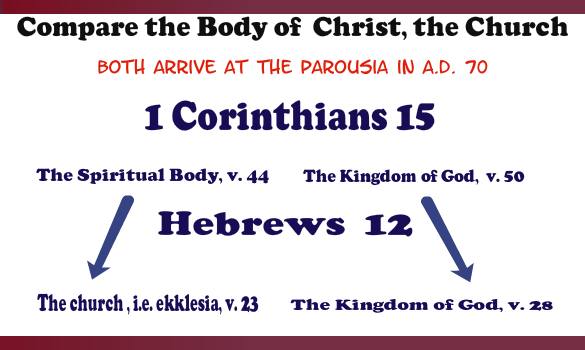 Therefore, the body of Christ arrived in fullness at the parousia, (Eph. 1:14; 22,23; Col. 2:17) as did the kingdom. But What About the Local Church? was a temporary institution only intended for the first century and thus ended in A.D. 70.
was not to go through the great tribulation but be delivered from it. There is no question that Christ is addressing the local church. He said the messages were for the seven churches which are in Asia. He speaks of the end of “Jezebel” apostate Judah, hence AD 70, saying that all the churches shall know when he destroys her. Likewise, they were told to hold fast until he came at which time he would give them power over the nations. In a post AD 70 world according to those who believe the church is extinct, there would be no local churches to rule over the nations. It is obvious in the Book of Revelation that Jesus likens the seven churches of Asia to the seven golden candlesticks or the candelabrum. But, the candelabrum was the subject of prophecy in the types and shadows of the Old Covenant. In the apocalyptic vision of Zechariah, the angel shows the prophet the lampstand of solid gold with the seven lamps with seven pipes, Zech. 4:1-2. The prophet inquires as to the meaning of them and no clear interpretation is offered. However, the risen Lord says the seven lampstands are the seven churches. Now the seven churches are local churches. The seven lampstands are the seven churches. Therefore, Zechariah prophesied of the seven churches, i.e. the local church in the Old Covenant! How then can the church, or even the local churches be an accident when they were prefigured in the types and shadow of the Old Covenant? We submit they are not accidents but intentional institutions ordained by God through prophecy. This is a devastating blow to the dispensational house of cards. This brings us to another important point in the study. We are told by Dispensationalists that the local church does not go through the great tribulation but is delivered from it. This is contrary to the Bible. Paul wrote that “through many tribulations” the local church would enter the kingdom of God. Why go through so much trouble to encourage these churches to steadfastness if their survival was only temporary? It makes little since especially since Jesus said promised the faithful that they would receive a crown of life, in death (Rev. 2:10). Since death ultimately brings the incorruptible body according to the IBD advocates, why the need to encourage people to endure hardship? Why not take death as the easy ticket to eternal life? Obviously, there must be some practical purpose for the survival and well being of the church. “The reason for the urgency, therefore, is probably quite pragmatic – that the gospel should be internationalized and the [local] church established beyond the boundaries of Israel before the destruction of Jerusalem and the dispersal of the disciples in Judea.” R.T. France, The Gospel of Mark, 516, quoted in “The Coming of the Son of Man,” Andrew Perriman, p. 28). France’s comments, therefore silences the critics on why the judgment on Jerusalem was important to those outside of Judea. Again, the welfare of the church was at stake! “At the Rapture the church will be removed from the earth and will be taken by Christ (John 14:1-3) to remain with Him throughout the Tribulation.” However, as Revelation 7:14 shows, the local church is not raptured from the earth but goes through the tribulation. In the text noted above, not only does the local church go through the tribulation, but Jesus says all the churches will know when he destroys the persecutors. The local church, survived, entered into and came out of the great tribulation. We have shown that the local church prefigures in the types and shadows of Old Testament prophecy, (Zech 4:2) We pointed out the local church played a role in the post AD70 acknowledgment of judgment and the rule of the nations on earth, Rev. 2:23).” The local church was not Judaism in anywise nor was it raptured as there is sufficient evidence which demands non-rapture. Therefore, the local church plays an important role in post AD 70 world.